Touchscreen games aren't for everyone, says Sony Ericsson, which is where the Xperia Play comes in. Now that the long-rumored "PlayStation Phone" has arrived, in the form of the Sony Ericsson Xperia Play, it's hard not to make comparisons with Nokia's ill-fated N-Gage. However, Sony Ericsson's Dom Neil-Dwyer says that history won't repeat itself and that the Xperia Play is unlike anything that has come before it. Neil-Dwyer said that the reason that Nokia was unsuccessful with the N-Gage was that it tried to make it a games machine first, and a phone second. With the Xperia, he said, Sony Ericsson had taken the opposite route, and made a fully functional smartphone that could also play games. "As you can see from the design ... when you hold it in portrait it's a smartphone," he said. "When you've got the game keys hidden and you're just holding it like that, people wouldn't know what it is, but obviously when you pop it open it's a great gaming device." He said that the target audience for the Xperia Play was younger smartphone users, who wanted something different from the more bite-sized far available on the likes of the iPhone and the Android markets. He said that the Xperia would be something that trendsetters would latch on to and embrace, and rejected the idea that it would only really appeal to a "techie" audience. "I think there's two types of people [who want the Xperia]. One is someone who's just in this because it's the only way they want to play games, because touchscreen games aren't great, and the other reason is a very kind of cool consumer. So I wouldn't say techie." Neil-Dwyer also said that the Xperia Play provided advantages for developers, despite being the difficulty in porting a game designed for the Xperia's controls to other smartphone platforms. He said that early data from Verizion suggested that people who purchased the Play also tended to buy more premium Android apps, which, when coupled with the extra visibility gained from working directly with Sony Ericsson, made it much easier to monetize Android apps. 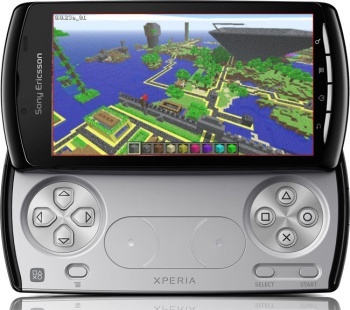 All Sony Ericsson asked for, he said, was a limited period of exclusivity, as was the case with the Xperia version of Minecraft. Neil-Dwyer says that Sony Ericsson's biggest challenge with the Xperia Play at the moment is building its install base. That's not going to be a walk in the park, as it has competition from both other smartphones and from dedicated gaming devices. That's not to say that the Xperia Play can't prevail, but it's going to be difficult.